Earlier this month, our location in Laguna Hills hosted Big Air’s Battle Royale. This innovative, world-first event, influenced by the excitement and massive popularity of Epic Games’ Fortnite, turned Big Air into an exciting, fog-filled laser tag map. Because of its overwhelming success, Battle Royale is now coming to selected Big Air parks throughout the country. The game play is simple: participants have one minute to find a laser tagger, build a fort and hide. Players then embark on a last-man-standing laser tag battle, while fog, special lighting, and pulsating electronic music keep the energy high. While battlers wait for their next game to start, giveaways, dance contests and a game lounge await. Speciality food & drinks are also available. 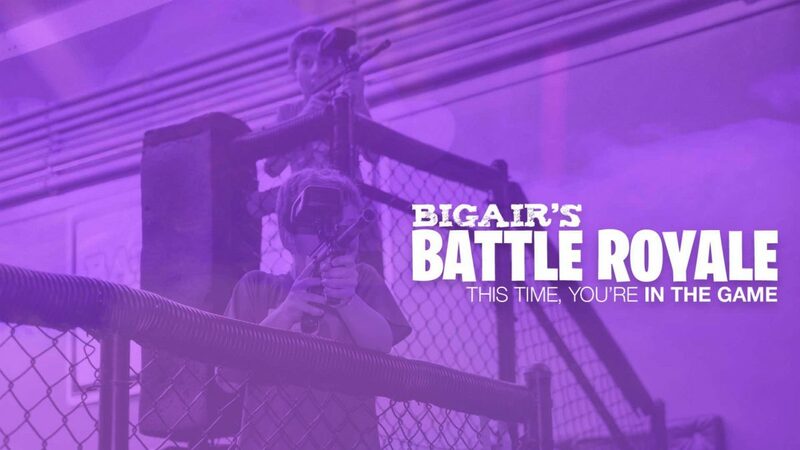 Big Air’s Battle Royale will continue on select nights at participating locations throughout the U.S. To find an event near you, visit us on the web at bigairusa.com. If you’re interested in franchising opportunities with Big Air, please visit bigairfranchising.com.